- Max confort e relax, nel verde, max silenziosità, indipendente, tranquilla, mare ( spiaggia sabbiosa ) a 200 mt.Arredamento esclusivo, nuovo e funzionale. Parking in ambito giardino villetta max 3 autovetture.Piscina privata SOLO PER AFFITTUARI VILLETTA,doccia acqua calda x piscina. Su terrazza villetta solarium oltre mq. 80, o con doccia acqua calda riscaldamento solare, tavolo, sedie e lettini: uso esclusivo locatari. Lingue parlate: Italiano , Tedesco, Russo. "It was really nice vacation - apartments are very comfortable and cosy, it''s location is convenient (about 5-7 min walking to the sea). Beach is clean and well-maintained. The supermarket isn''t very close but there are several bicycles for the guests that makes visits to supermarket very pleasant. There are a lot of interesting historical and cultural places around to visit. Many thanks to Antonio and his wife for their kindness and helpness. Our special recommendations - Bar Museo in Paestum (just on the right of the Museum) with the best icecream, small restaurant on via Tavertina and pizzeria on the beach with best pizza in the neighbourhood. And of course farm where you can by the most fresh mozarella." "We had wonderful 2 weeks stay there. 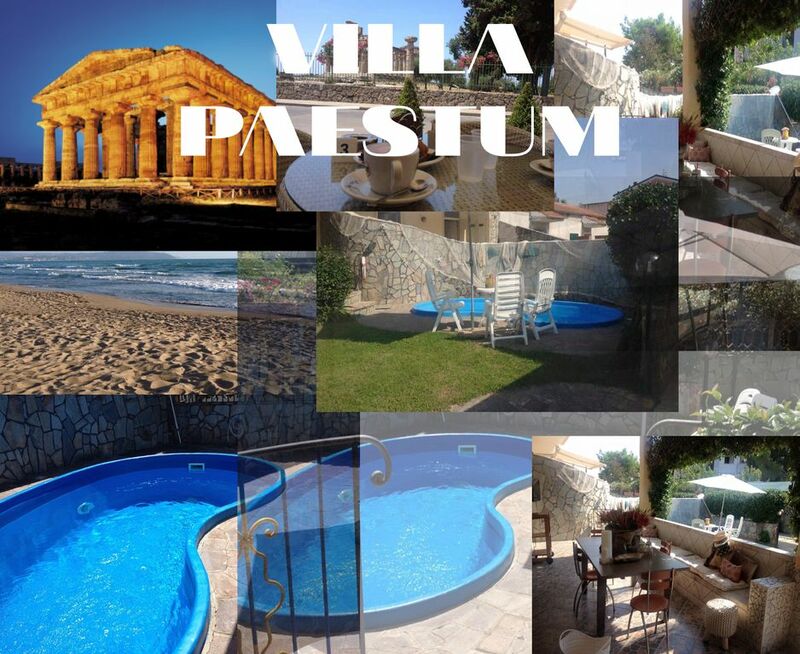 The villa is superb, with excellent garden and pool. My wife really appreciated the kitchen. The sea is very close and the beach is excellent. There are no hypermarkets nearby, but the shops and restaurants in the village more or less compensate for this small inconvenience." Antonio, thank you very much! "The accommodation was comfortable and clean with very good amenities and access to the sea. There were many places of interest to visit and it was well placed for Pompeii, Herculanium, Almafi etc. The owner was also very hospitable and helpful." La casa corrisponde al 100% con l'offerta proposta! L'accoglienza dell signora Myra, la pulizia, e la cordialità sono stati un valore aggiunto! Quando tornerò a Paestum cercherò nuovamente questa "opportunità"! Propre, fonctionnelle, spacieuse, confortable, une situation géographique adaptée à ce que nous souhaitions faire dans la région. Une réactivité de la part de notre hôte que nous avons apprécié. Quelques courses de base nous auraient aidé (un peu de café, thé, sucre...) mais à part ça nous recommandons cette maison. Merci pour ce très bon accueil ! Point négatif indépendant de la prestation : pour de longues distances dans les terres, il faut partir plus tôt que prévu il n'y a qu'1 seule route le long de la mer avec beaucoup de monde. C'est long pour récupérer l'autoroute ! (Text automatically translated) Schuhmann hotel and restaurant, Esplanade and Savoy beach hotel and restaurant. LIDO Restaurant ATHENA SEASIDE - fresh seafood specialties: buffalo mozzarella DOCG and Neapolitan pizza.